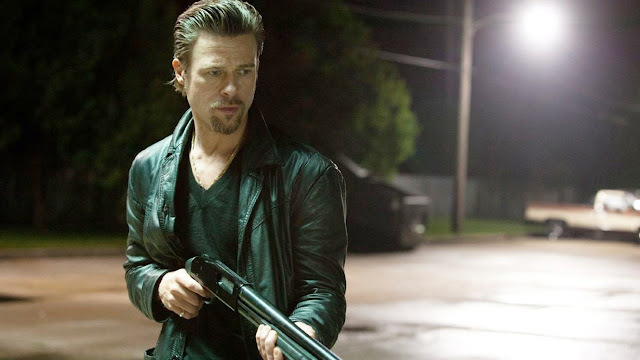 Released on the cusp of the 2012 awards season, Andrew Dominik's Killing Them Softly was strangely, some might say cruelly, ignored by most of the mainstream awards, a fate which mirrored its failure to connect with a broad audience. Granted, it's still the most commercially successful film of Dominik's career and it did not want for critical attention, but this seems much too modest a fate for a film which, whilst flawed, is still a fascinating, often brilliant attempt to make a down-and-dirty crime thriller which doubles as a (perhaps too) pointed political commentary. Frankie (Scoot McNairy) and Russell (Ben Mendelsohn) are a pair of low-level hoods trying to scrape together a living amongst the criminal underclass of New Orleans. Whilst Russell's ambitions don't extend beyond kidnapping dogs and selling them on, Frankie has a touch more vision, and it's this that leads him to accept a job for Squirrel (Vincent Curatola), a local gangster who's fallen on hard times and has struck upon a plan to get a whole load of money without suffering any repercussions. Several years previously, a man named Markie (Ray Liotta) hired some men to rob an underground card game that he ran, taking the money for himself and destabilising the criminal ecosystem for a few months. Markie eventually owned up to his part in the heist, but because he was so well liked and the move was so audacious, everyone treated it as a ballsy stunt and let him get away with it. If the card game got robbed a second time, however, everyone would suspect Markie of orchestrating it. So Frankie and Russell commit the robbery, safe in the knowledge that Markie will take the fall. To clean up the mess and restore confidence to the community, the powers-that-be bring in Jackie Cogan (Brad Pitt), a ruthlessly efficient hitman who sizes up the situation quickly and accurately: Markie couldn't have had anything to do with the robbery because he would never be so stupid to rob his own place two times, so someone else has to be responsible. However, Markie's innocence doesn't mean a thing to someone as pragmatic as Jackie. As he explains to his handler, Driver (Richard Jenkins), the only thing that matters is that someone is seen to pay for the crime, whether or not they were the ones behind it all. Markie has to die, and if the right guys get taken down along the way, that would be a bonus. Matters of justice don't matter where the market is involved. Although Brad Pitt is undoubtedly the star of Andrew Dominik's Killing Them Softly, its strength lies in its supporting cast, an ensemble which includes two surprisingly big names in the shape of Barack Obama and John McCain. The film is set against the backdrop of the 2008 financial collapse and accompanying Presidential election, and both men are heard frequently on television and radio discussing the situation. Purely in terms of word count, the two Senators would probably be fourth or fifth billed (whilst George W. Bush would probably get an "and" or "with" credit), since seemingly every moment of silence is filled with some archived discussion of how bailing out the banks is the only course of action, even though it's also morally reprehensible. It's not difficult to see the parallels between the actions being taken by low-level criminals and those being carried out by some of the most powerful men on Earth, and nor is it meant to be. Dominik's script, based on the 1974 novel Cogan's Trade by George V. Higgins, makes its intentions clear early and often, both through the omnipresent white noise of political chatter, but also through its characters' hard-boiled dialogue, almost every line of which serves to underline and highlight in bold type what the themes of the film are. That's not a criticism in and of itself, since Killing Them Softly is not meant to be a subtle and nuanced discussion of the morality of macro-economics, but the obviousness of the script at times threatens to derail the film and turn it into a feature length lecture about the evils of appeasing the market at the cost of destroying lives. Fortunately, the performances are so strong and the actors giving them do such a wonderful job of grounding the political in the personal that the film manages to be both a polemic and a compelling drama, rather than sacrificing one for the other. There's a general tone of melancholy weariness throughout, with almost everyone resigned, to a greater or lesser extent, to their role in the story that is about to unfold. On the one end of the spectrum you have Jackie, who is fully cognizant of what is required of him and every other player in their bloody farce and, as such, views everything with a logical dispassion, and at the other end you have Mickey (James Gandolfini), a hitman that Jackie brings in to help carry out the hit on Markie. Now, Gandolfini spent the better part of a decade playing a world-weary murderer on The Sopranos, so it would have been all too easy for him to throw out the old familiar mannerisms. What's wonderful about his turn here, and what sets it apart as the best performance in the film, is how he suggests so much about Mickey without really doing anything. Most of his scenes are spent confined to a hotel room where he gets increasingly drunk and belligerent, but through his sheer physicality he conveys the bitterness, sadness and loss of all joy that makes Mickey a compelling, if utterly unsympathetic, character. He looks like a man visibly being crushed by the world around him, barely holding it back with his significant bulk, and Gandolfini gets that across better through just appearing on screen than through saying any of Dominik's words, which again tend to be blunt and on the noise in a way that goes beyond noir styling. Most of the best moments, for that matter, are the ones in which the dialogue is minimal or absent entirely. Even though the film's vaulting ambition lies in its attempts at political critique, it still works wonderfully as a brutal, tense and occasionally haunting crime story. The heist that kicks the plot into gear is deeply tense and unnerving, brimming with potential energy as it seems that any of the violent criminals - either the ones being robbed or the ones doing the robbing - could make the wrong move, and later in the film Dominik delivers possibly the saddest, loneliest and most melancholy drive-by in cinema history. He also displays, in scenes such as a flashback in which Liotta is violently beaten, the same knack for crafting moments which are alternately funny, horribly violent and deeply uncomfortable that made his debut, Chopper, such an indelible work. Although it ultimately fails to completely convince as a searing work of social commentary, though not for lack of trying (in fact it does the opposite, quite aggressively) that doesn't stop Killing Them Softly from being one of the very best films of last year. Dominik's consummate skill as a manufacturer of by turns bleak and elegiac violence, coupled with a fantastic cast all working at the very top of their abilities, ensures that the film is never anything less than engaging. At the same time, the contrast between the real-world concerns and events playing out in the background and the overtly stylised story and characters give a curiously sad "state of the nation" feel to the whole thing. It's a film that really feels like it's a story about America, one that offers a bleak, nihilistic vision of life on the bottom rungs of the economic ladder which lends the whole thing a distinct flavour, even if the real meat of the thing lies in the more prosaic business of gangsters killing each other. Then again, given both the real and cinematic history of the country, is there anything more American than that? You know things must be tough out there if the members of the criminal underclass are forced to do things that they have serious moral qualms about.